FINALLY NO MINIMUMS! You can finally customize a shot glass online without having to order 50 of them! Our customizable ceramic shot glasses make a fun addition to any bridal party and make a cool gift! Perfect for Bachelorettes, Bachelors or Groomsmen gifts. Makes a unique keepsake to remember the special day ...of when you got a customized shot glass! The baddest of all the mermaids celebrate together in unity. 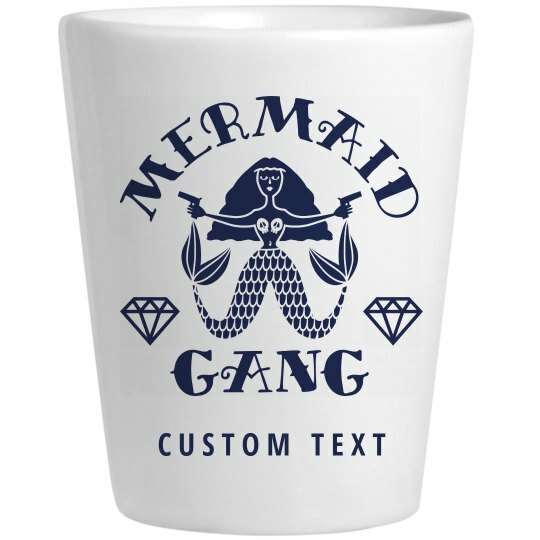 When your mermaid gang is taking celebratory shots for the bride-to-be, they should be doing it with matching shot glasses. You can even add any custom text to the bottom!